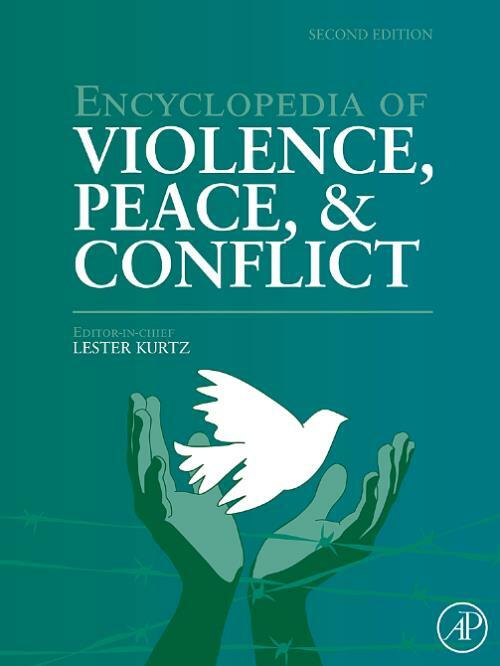 The 2nd edition of Encyclopedia of Violence, Peace and Conflict provides timely and useful information about antagonism and reconciliation in all contexts of public and personal life. Building on the highly-regarded 1st edition (1999), and publishing at a time of seemingly inexorably increasing conflict and violent behaviour the world over, the Encyclopedia is an essential reference for students and scholars working in the field of peace and conflict resolution studies, and for those seeking to explore alternatives to violence and share visions and strategies for social justice and social change. Covering topics as diverse as Arms Control, Peace Movements, Child Abuse, Folklore, Terrorism and Political Assassinations, the Encyclopedia comprehensively addresses an extensive information area in 225 multi-disciplinary, cross-referenced and authoritatively authored articles. In his Preface to the 1st edition, Editor-in-Chief Lester Kurtz wrote: "The problem of violence poses such a monumental challenge at the end of the 20th century that it is surprising we have addressed it so inadequately. We have not made much progress in learning how to cooperate with one another more effectively or how to conduct our conflicts more peacefully. Instead, we have increased the lethality of our combat through revolutions in weapons technology and military training. The Encyclopedia of Violence, Peace, and Conflict is designed to help us to take stock of our knowledge concerning these crucial phenomena." Ten years on, the need for an authoritative and cross-disciplinary approach to the great issues of violence and peace seems greater than ever. Lester R. Kurtz has served as Chair of the Peace Studies Association and of the Peace and War Section of the American Sociological Association. He is a Danforth Fellow and recipient of the Fulbright Research Fellowship, National Science Foundation Grant (Republic of China), American Institute of Indian Studies Fellowship, and the Indo-U.S. Subcommission Fellowship. He is a professor of sociology and Asian studies at the University of Texas at Austin and has been a visiting professor at the University of Chicago, Northwestern University, Tunghai University, and the University of Delhi. He holds a Ph.D in sociology from the University of Chicago and an M.A.R. in religion from Yale University. He has written widely on peace and conflict, world religions, Ghandi, nonviolence, and the arms race, and has lectured in Europe, Asia, and North America.